Nearly 40 years ago, French model Maryse Gaspard danced along the Great Wall dressed in a stunning gown during her first visit to China with Pierre Cardin. A year earlier, in 1978, the French couturier became one of the first Western fashion brands to enter the Chinese mainland. The same year as Gaspard’s visit, Pierre Cardin also became the first foreign brand to hold a fashion show in the Chinese mainland after the country’s adoption of its reform and opening-up policy in 1978. Now a manager for the brand’s women’s wear department, the 70-year-old Gaspard, still elegant and slim in an all-black suit, posed once again for the media on the Great Wall on Thursday after attending the Pierre Cardin 2018 show in Beijing earlier that day. In addition to celebrating the brand’s 40th year in the mainland market, “the show is also dedicated to the 40th anniversary of China’s reform and opening-up,” Fang Fang, the brand’s chief representative in China and the event’s general supervisor, told media at a press conference after the show. The fashion show took “Rouge de Cardin” as its theme. “On the one hand, Rouge de Cardin is the brand’s symbolic color; on the other hand, the color red is often regarded as the representative color of China,” said Fang, explaining the meaning behind the theme. 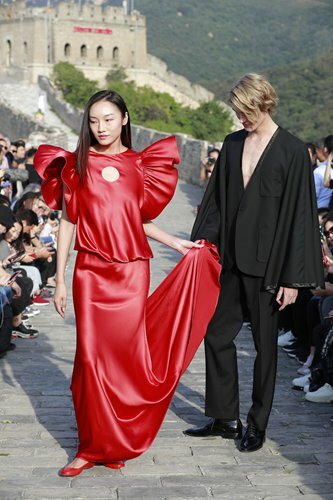 Putting on display 40 classic collections from its Paris headquarters as well as 40 fashions from the 2019 Spring-Summer collection designed by Chinese designers, the show turned the 1,000-year-old meandering stone roads and battlements of the Badaling section of the Great Wall into a runway background. Kicking off with women’s leather jumpsuits decorated with the brand’s classic geometrical patterns, the show also showcased a new men’s collection featuring loosely fitting shirts and jackets paired with skinny trousers. The brand’s daywear collection included simple cut turquoise and dark green dresses and a series of men’s jackets made of space cotton and suede. The highlight of the show was definitely the wedding dress collection, which showcased a layered dress worn by a ballerina who danced along the runway to late French composer Jules Massenet’s Meditation. Moreover, one of the wedding dress looks also featured an ivory white hat decoration inspired the Chinese conical bamboo hat, an element added by Cardin exclusively for the show. Still one of China’s most recognized foreign fashion brands, Pierre Cardin established its bond with the Chinese fashion industry decades ago. Pierre Cardin, the chief designer for whom the brand is named, first gained a name for himself among the Chinese public via a 1978 black-and-white photo that showed the then 56-year-old designer dressed in a lengthy overcoat and a scarf walking down a street in Beijing with his hands in his coat pockets as Chinese onlookers dressed in classic Mao suits stare at him with eyes full of curiosity. In late 1970s, the concept of “fashion” was still kind of strange to many Chinese during a time when dark blue and army green Mao suits dominate mainstream daywear. The runway show held by the French designer the very next year at Beijing’s Cultural Palace of Nationalities, the first fashion show run by a foreign brand after the reform and opening-up, was a blow to the country’s aesthetic system, according to an article from the Beijing Digest. “On a temporarily-built runway, eight French and four Japanese models brought by Pierre Cardin moved their hips as they walked the catwalk to pop music tunes. These tall beauties with their relaxed facial expressions and clothing with shoulder pads drew a sharp contrast to the Chinese audience members dressed in blue and grey clothing that sat looking at them breathlessly from below the stage,” wrote the article. Forty years after the 1979 show – a time when colorful clothing, stylish designs and international fashion brands are no longer strangers to Chinese people – the French brand is still remembered as a symbol of China’s fast-growing fashion industry. 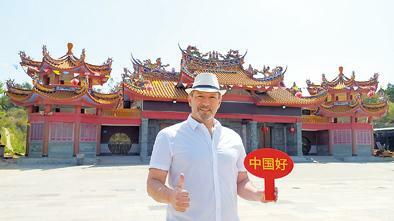 “The Great Wall show is very special as we wanted to retrace the footprints of the brand and of Mr Cardin, who climbed the Great Wall for the first time 40 years ago during his first trip to China,” said Fang. The moves by Taiwan are both pitiful and ridiculous. 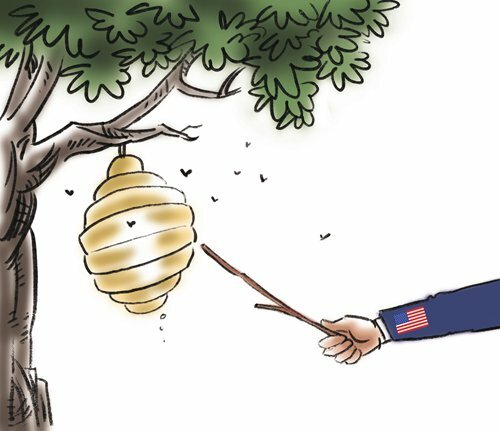 It is clear that Taiwan authorities have thrown themselves at the US and have become the only party to pick a side between Beijing and Washington amid their intense trade frictions. This is the extra cost that Taiwan needs to pay for the worsening cross-Straits relations due to its leader Tsai Ing-wen. If cross-Straits ties were to retain a more normalized state during the Ma Ying-jeou era, Taiwan could seek some kind of “equality” in its relations with the US or even strike a balance between the US and the Chinese mainland. But now, the Democratic Progressive Party can only kneel down to Washington. In 2017, the Chinese mainland bought 30 million tons of soybeans from the US. If US farmers lose this business because of the trade war, what’s the use of Taiwan buying a few million tons? Taiwan authorities are eager to show their “loyalty” to the US, but US farmers will find it both laughable and annoying. The population of Taiwan equals that of Beijing, and Taiwan cannot consume that many US soybeans. That Taiwan buys US soybeans is like buying arms and sending US money. But even arms won’t guarantee Taiwan security, let alone soybeans. Taiwan’s security can only be secured through political means not military means. If Taiwan makes itself a pawn of external forces to oppose the Chinese mainland, it will lose leverage to gain security for itself and set itself adrift amid China-US competition. Taiwan should also be clear that its trade surplus mainly comes from the mainland and amounts to tens of billions of dollars annually. The mainland will not interfere with Taiwan developing normal trade ties with other countries, but Taiwan should not exploit these ties to target the mainland. If Taiwan helps external forces hit the mainland’s economy, it will become a target of control by the mainland. Taiwan is too small to afford to play this game of politics and geopolitics. Taiwan should try to seek balance among major powers rather than catering to the US while confronting the mainland. This should remain the fundamental political philosophy of Taiwan before the reunification of the mainland and Taiwan. It is time for Taiwan to have true self-reflection. 51-year-old Colombian Hector Palacio recently wrote a Latin American-style song in Chinese as a gift to China, a country where he has spent nearly half of his life. The song “China is Good,” using a cheerful and catchy melody, expresses his love for the country. Although the lyrics are simple and even contain some grammatical errors, Palacio’s sincerity still bestows a sense of inspiration to listeners. Palacio came to Beijing to study in 1996, with a strong desire to have an exotic experience. However, his life in China was not as wonderful as first expected. He found the Chinese language and local food challenging, and it took him eight months to learn how to communicate in basic Chinese. 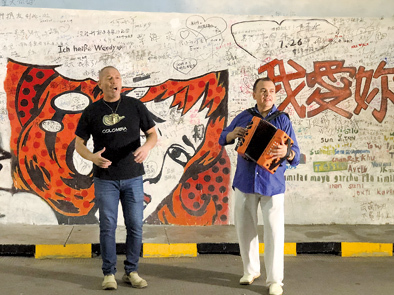 Palacio and Soto sing the song on the campus of Xiamen University. “I stayed alone in my dormitory, feeling homesick every day,” Palacio told Xinhua News Agency, adding that this bitter beginning shows itself in his song. Thanks to the friends he made in China, his life got better. As a sports fan, Palacio established a profound friendship with the people he met during soccer and basketball games, both Chinese and foreigners. It was this bond that helped him decide to stay in China. Of course, this part of his experience also found itself into the lyrics of his song. In addition to Beijing, Palacio has worked in plenty of other Chinese cities including Shanghai, Hangzhou, and many in southern China. What’s more, he even married a Chinese woman in 2012 and settled down in the country. In winter of 2017, Palacio met Angel Soto during a football game in southwestern China’s Chongqing municipality. Soto, a musician from Colombia, invited Palacio to his studio after hearing the latter’s wish to make a song. They also filmed a music video and uploaded it online. The video has now been watched nearly 30,000 times. “The song is dedicated to China, so the name and story are all about the country. I hope that every Chinese person will enjoy the song, and know it’s a gift from a Colombian,” Palacio noted. “I hope the song can be a bond linking China and South American countries,” he added. According to a report published by the Organization for International Investment (OII), the US registered a foreign direct investment (FDI) of negative $8.2 billion in the second quarter of 2018, compared with the previous quarter’s net FDI of $63.7 billion, Xinhua reported on Sept. 27. It was the first negative FDI figure since the second quarter of 2014. The drop in FDI indicates that transnational corporations have suspended potential investment in the US, no doubt due to the tariff policy on imports and other trade policies implemented by the Trump administration. The report pointed out that FDI has directly driven the American economy forward. Transnational firms have created more than 6.8 million jobs in the US through building factories and running businesses there. They have also boosted technological research and development in the US. The report said that the US remains an attractive investment destination. However, the global competition for FDI is becoming fierce as more countries race to position themselves as investment destinations. 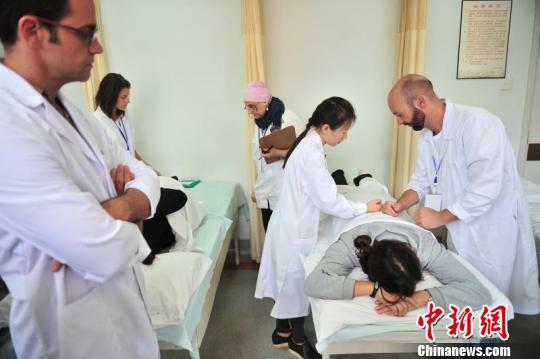 Foreign physicians learn massage at the TCM Hospital of Yunnan Province. Details regarding traditional Chinese medicine (TCM) will be included for the first time in the 11th version of the World Health Assembly’s global compendium, which will be published next year, according to nature.com, Thepaper.cn reported on Sept. 27. The compendium is also known as the International Statistical Classification of Diseases and Related Health Problems (ICD). The document categorizes thousands of diseases and diagnoses and sets the medical agenda for more than 100 countries. The information will appear in Chapter 26 of the document, which states the categorization of traditional medicine. The chapter is set to be implemented by member states of the World Health Organization (WHO) in 2022. The inclusion of TCM information in the WHO document is the result of more than 10 years of hard work from TCM practitioners around the world, led by Choi Seung-hoon, the former traditional medicine adviser for the Manila-based western Pacific office of the WHO. The WHO’s decision will help spread TCM around the world. Ryan Abbott, a medical doctor who has also trained in TCM and is a member of the Center for East-West Medicine at the University of California, Los Angeles, said the WHO’s decision in regards to TCM is a mainstream acceptance that will have a significant impact around the world. The WHO has avidly supported traditional medicine, and TCM above all, as a step toward its long-term goal of universal health care. According to the agency, traditional treatments are less costly and more accessible than Western medicine in some countries. 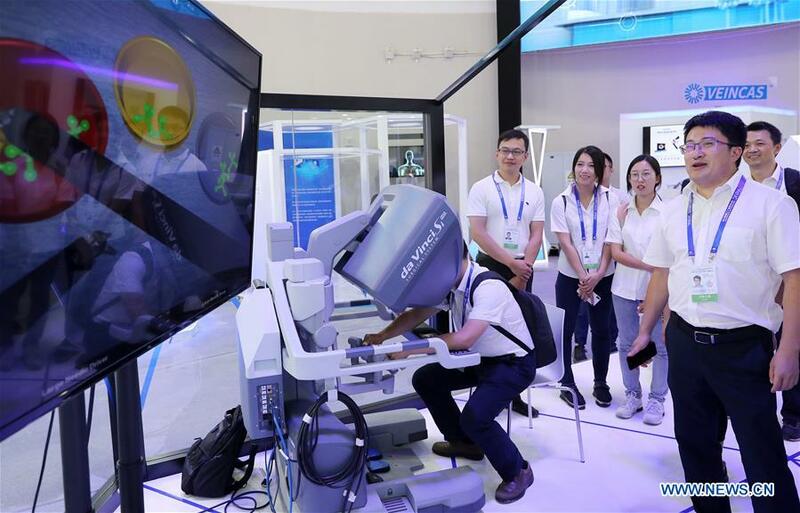 Consumption has grown into China’s largest power for growth, making up nearly 80 percent of the country’s GDP growth, according to a special session of the 2018 China Development Forum held this Monday. China’s economy is now less dependent on capital input and foreign trade, the session said, predicting that the consumption market will further boost the country’s economic growth. The role of consumption in China’s GDP growth has changed dramatically over the past seven to eight years, previously contributing less than 50 percent of China’s economic growth. Mao Shengyong, spokesperson of China’s National Bureau of Statistics, once disclosed that internal demand was a decisive factor for China’s economic growth, and consumption played a major role in China’s internal demand. In addition, the upgrading of China’s consumption market is also driving the country’s economic development. 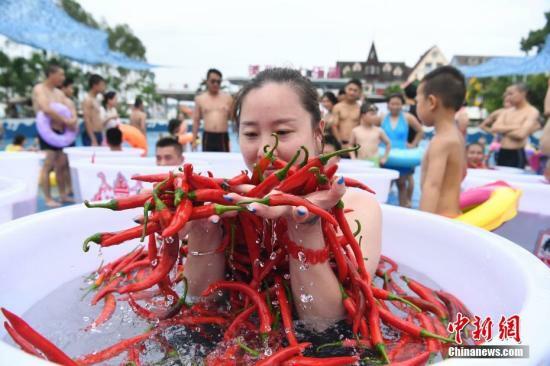 Zong Qinghou, Chairman and CEO of the Hangzhou Wahaha Group, the leading beverage company in China, noted that between 300 to 400 million Chinese people are middle-class income earners who are relatively well-off. As such, this group are developing toward higher-level consumption, and in turn China’s consumption market has growing potential, Zong added. A panda in the Dujiangyan Base of the China Conservation and Research Center for Giant Pandas. While visiting panda breeding bases in China, journalists from Japan and the U.S. said they gained a deeper understanding of the cultural connotations of the giant pandas, Sichuan Daily reported. Pandas are iconic in China, meaning they don’t need to be advertised, the foreign reporters told local media during their visit to a panda base in Sichuan in southwest China. “I have to say that pandas are really charming,” said Beijing Bureau Chief for the LA Times with the Chinese name Di Ruobing. “Getting closer to the natural habitat of giant pandas, I hope to tell what I saw here to my readers, who are animal protection enthusiasts,” she said. “In Japan, giant pandas represent China,” said a reporter from Japan’s NHK, adding that the Japanese people’s love for pandas is beyond imagination. “Unlike man-made cultural symbols such as the Kumamon, giant pandas are very special and cannot be duplicated,” he said. 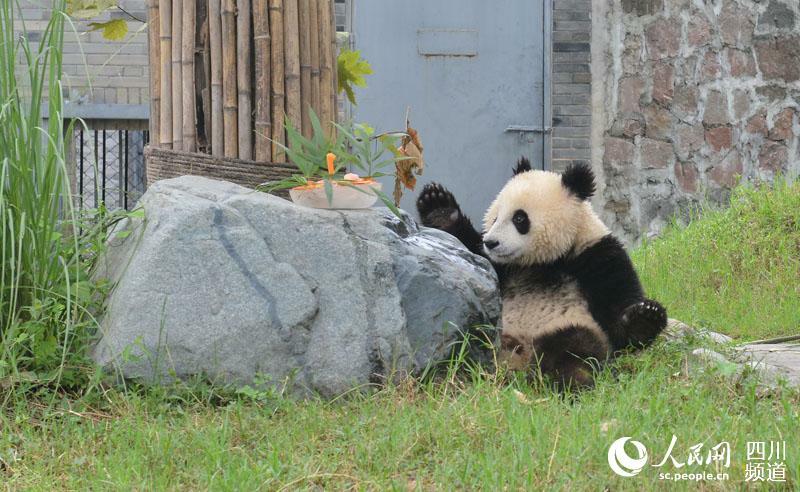 The reporters said they think the Dujiangyan Base of the China Conservation and Research Center for Giant Pandas (CCRCGP) is the closest one to nature they’d ever seen. Di said both she and her readers are deeply interested in protection and scientific research of giant pandas. The NHK reporter also said he came to Sichuan to find out the secrets and reasons behind the rising number of newly born pandas in China. Di said the national giant panda park that the Chinese government is currently building is important to the protection of giant pandas and other animals. She suggests the building of diversified protection mechanisms and scientific research mechanisms to tackle the issue of releasing more giant pandas into the wild. Japan was the first country to sign a scientific research agreement regarding pandas with China, the NHK reporter said. Over the past two decades, China and Japan have worked together to address a lot of difficult issues. He hopes that in the future, cooperation will be further strengthened. Customers buy freshly-baked mookcakes in a store of Daoxiangcun. Baking and selling mooncakes in the same spot has become a business tactic this year. In a store of Daoxiangcun, a traditional Beijing-based brand, a 30-meter-squared transparent kitchen was set up to provide timely replenishment of mooncakes. A staff member of the shop said that one person had bought 40 Yunnan ham mooncakes as soon as they left the oven on Sept. 13. On the same day, baked mooncakes sold out within an hour of being ready to eat. The shop currently sells over 1,000 mooncakes per day, and the total number of cakes sold this year is expected to reach 100,000, according to the store manager. 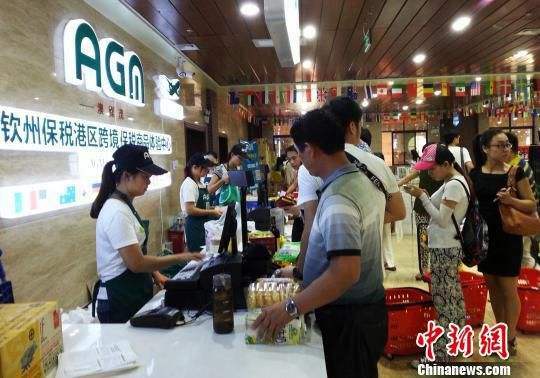 A manager of an Ito Yokado supermarket in Beijing said that making mooncakes at the selling site is a creative move that could draw customers to the baked goods. Pizza Hut is also grabbing the attention of consumers with special mooncake gift boxes themed on the Palace Museum. This year’s gift boxes are made using recyclable materials to help avoid extravagance and waste.